Home » toys » Should Toothbrushes be Thrown Out After Strep Throat? As with so many things with medicine, this question which sounds so straightforward unfortunately has no straightforward answer. After all, there have only been a few studies that have specifically looked to answer this question. And the answer is decidedly ambiguous as the few studies done so far either support or disprove this practice. Two studies have found no difference in recurrent infections whether one keeps using an old toothbrush or replaces it with a new one after a strep throat. 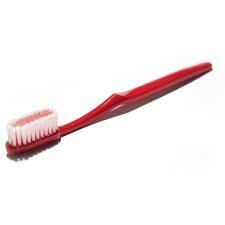 In one study, even NEW toothbrushes contained harmful bacteria. Of course, there are several studies that support this practice. In fact, environmental hygiene in general is also disputed with studies supporting for as well as against this practice after an illness. Check out a few references below to add more mud to the confusion. Of course, with multiple recurrent episodes of strep throat, tonsillectomy surgery is quite helpful. Also given the confusion, perhaps the safe course would be to disinfect a toothbrush regularly. Recurrence rate of streptococcal pharyngitis related to hygienic measures. Scand J Prim Health Care. 1998 Mar;16(1):8-12. Contamination of toothpaste and toothbrush by Streptococcus mutans. Scand J Dent Res. 1978 Sep;86(5):412-4. Persistence of group A beta-hemolytic streptococci in toothbrushes and removable orthodontic appliances following treatment of pharyngotonsillitis. Arch Otolaryngol Head Neck Surg. 1998 Sep;124(9):993-5.